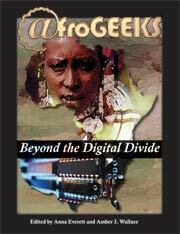 Back in the day, let's say the late 1990s, Alondra Nelson began organizing this online discussion group focused on race, technology, African American culture, and science fiction. The afrofuturism list, or "the List" as most of the members called it, was a wide ranging group of visual artists, poets, graduate students, junior scholars, musicians, and other participants. Among other projects, the AF group prompted Nelson to edit a special issue of Social Text in 2002 on Afrofuturism. Scholar Anna Everett, a long-time participant on the List and a contributor to the Social Text special issue on AF eventually organized this series of AfroGeek conferences--"From Technology to Technophilia (a race and technology conference)" in 2004 and "Global Blackness and the Digital Public Sphere" in 2005. Along with Amber Wallace, Everett co-edited AfroGEEKS: Beyond the Digital Divide (2007), and she authored Digital Diaspora: A Race for Cyberspace (2009). It's more than a notion that Adeline Koh invited Alondra Nelson to serve as a respondent for the "Representing Race: Silence in the Digital Humanities" panel at MLA and that a couple of panelists gave shout-outs to Anna Everett during their presentations. For some of us at least, Nelson and Everett preceded, or better yet, primed us for the now active discussions about race and digital humanities (DH) taking place in the academy. I'll resist getting too nostalgic about my time on the List back in the day. There are likely many new, important lessons that DH provides us in our current moment, not available back then. I am fascinated, though, that Nelson's AF list seemed to attract a broad, diverse range of participants, which included large numbers of non-academics in ways that the more well-funded DH scholars and institutions have not figured out how to do just yet. I'm also interested in understanding the general links and departures between AF and DH as ways that some of us engage technoculture.